In most of the developing countries, there are either, petrol, diesel or gas powered three-wheelers called auto-rickshaws running on the roads. Perhaps, these are some of the most polluting vehicles as these vehicles run only at 15-20 km/hr speed thereby producing even more pollution as against their designed speed of 40-45 km/hr. We should utilize nature’s free energy – Solar Energy – which is abundantly available to us. A solar power auto-rickshaw could be a game changer in curtailing the climatic pollution and also it improves our health and saves money. The Sun supplies around one kilowatt of energy per square metre, which just happens to be the roof area of a typical rickshaw. Using efficient solar panels we could harness maximum solar energy for public transport vehicles. 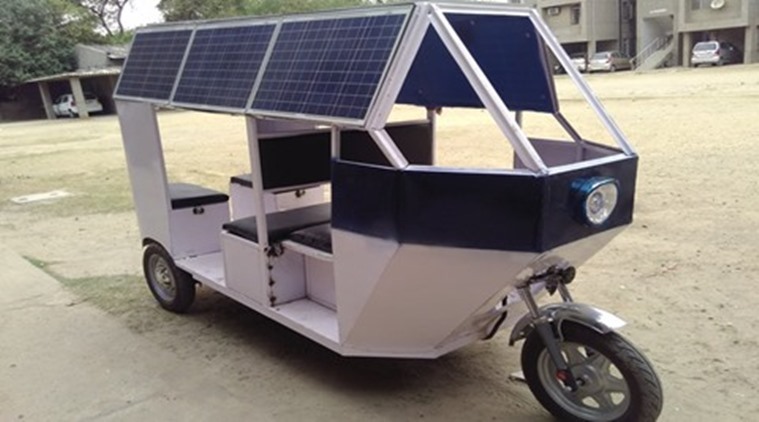 Vikram Pratap Singh and Taranpreet Singh – the students of Netaji Subhash Institute of Technology (NSIT) have invented a solar powered e-rickshaw with a aim of greener public transport in India. Idea of developing an e-rickshaw came when they recently presented a prototype for an electric bicycle at a college fest. They have developed this e-rickshaw after almost two years of research and have patented it in November 2015. E-rickshaw produces around 360 watt power. It has total nine solar panels fitted at different location to harness maximum solar sunlight. The cost of e-rickshaw would be around Rs. 1.2 lacs (appx 1750 USD). It gives approximately 50 per cent more mileage than a traditional e-rickshaw. It consists of four lead acid batteries with both batteries and solar panels. "I was at a college fest with my professor presenting a model of an electric bicycle when it occurred to me that Delhi as a city was in dire need of a clean energy automobile to help ease its pollution woes. Speaking with rickshaw drivers in the city, my idea grew more certain. But it was after long conversations with e-rick drivers in the city that gave me the idea to make a solar powered e-rickshaw for Delhi," Vikram said, as reported by The Indian Express.